Being a Sitecore developer, you must have heard a term called “Rendering Parameters”. In today’s post we’ll together explore the Rendering Parameters with WWH (What, When & how) scenarios. When to use Rendering Parameters? How to use Rendering Parameters? So I’ll keep this post as simple as possible and will explain you the concept of Rendering Parameters. Rendering Parameter is a way to pass the additional item(s) to the rendering or component apart from rendering data source. Let’s assume, you are in a situation where content editors need to use some additional items on a component apart from its actual data source. For example – I am going to use Rendering parameter to pass an additional CSS class to the component, which will allow my content editors to choose the style of their component. Let’s jump to the exercise to understand the complete scenario and see how we can make use of Rendering Parameter. This complete exercise is divided into 3 easy tasks. Which I’ll be explaining you one by one. And create the fields as per your requirement. In my scenario – I just need a single text field. See the below image. 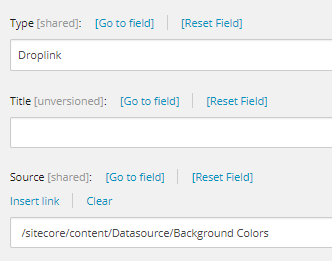 You can notice here that your complete template field(s) and section are available here and Content Editors can make use of this to pass some additional data to the component or rendering. In my scenario, I am using MVC and used a controller rendering to make it work. So I’ll show the code to access the parameter value in MVC controller action. Well, if you are using ASP.NET instead of MVC then I assume you must be using the Sublayout as renderings and that should not be a show stopper for you. You can still use the rendering parameters in the same way we use for MVC controller renderings. The Only task which is going to be a bit different is – reading the parameter value in code. So nothing to worry, here is the code to read the rendering parameter value from .ascx.cs file. And that’s all about the Rendering Parameters.